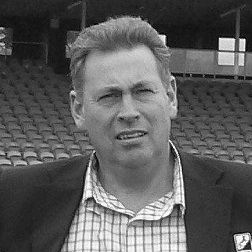 Robert Groenewegen first came to Tasmania after a serviceable VFL career with Footscray, during which time he played 79 games in 10 years and was a member of the Bulldogs’ 1985 preliminary final team against Hawthorn. Appointed captain-coach of Glenorchy in 1988, Groenewegen took the Magpies to the grand final, where they were defeated by Devonport in one of Tasmanian football’s most spiteful encounters. A one-season return to Victoria to play for Williamstown was followed by a permanent move to Tasmania in 1990 – this time to North Launceston – and it was here that Groenewegen would end his career, playing 62 games in six seasons with the Bombers, including as a member of the 1995 Statewide League premiership side. ‘Wagon’ played mostly as a ruckman or key forward, and though he was able to use his 193cm height to great effect around the ground his athleticism was marred by a series of major injuries over his career, most notably a knee reconstruction in 1981 that robbed him of much of his youthful spring. After his on-field career ended at the end of 1996 Groenewegen remained in Launceston, with his career as a town planner leading to a role as the manager of the York Park and Inveresk Precinct, including Aurora Stadium. Under Groenewegen’s watch the ground underwent a series of redevelopments to bring it up to AFL standard, resulting in Hawthorn and St. Kilda playing over 50 matches at the venue since the turn of the millennium, an arrangement he also helped engineer as a member of the Football Tasmania (later AFL Tasmania) board.